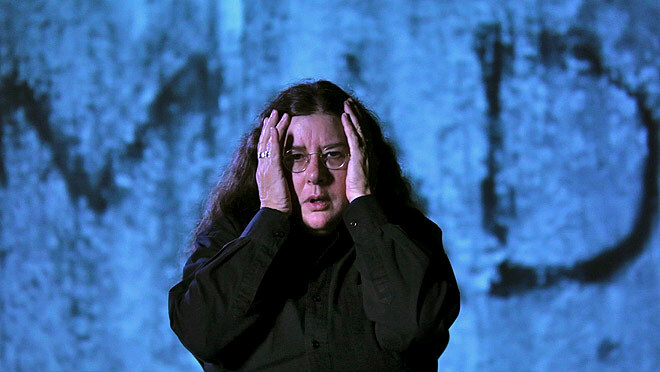 MAD, a music-theatre work created by Meryl Tankard, is ‘in progress’. However it should be discussed not only because its subject matter breaks new ground, but also because the work, still in a very raw state, deserves further development. Tankard uses Jeffs’s poetry as the both the framework and the content of MAD, drawing on 18 poems from collections that span the years from 1993 to 2001. She has collaborated again with Regis Lansac on video design, with Elena Kats-Chernin who composed the score, and with singer Mara Kiek. Actor Celia Ireland and dancer Hannah Scanlon join Kiek on stage. Scanlon is the newcomer to the work having had only four days to learn it before opening. Using her poetry as the vehicle, MAD explores Jeffs’ struggle with schizophrenia in spoken and sung text, and in movement. It is a series of short scenes that are in turn deeply moving, funny, and at times confronting. Kiek, a specialist in the Bulgarian vocal technique, has a raw, rather strident tone in her very expressive voice. For the recorded accompaniment including viola, clarinet and guitar, a musical saw adds a further plaintive dimension. Otherwise Kats-Chernin accompanies Kiek live on the piano in songs that allow the text to shine through with clarity. For Kats-Chernin too, the words were the inspiration for music that has been pruned to its absolute essence – as she says, giving the words space in which to breathe life into the work. Back video projections are effectively used throughout to add visual texture, beginning with a black and white moving image of clouds that distorts as the sound of a violent explosion of glass transports us into Jeffs’s world. The phrase sung at one point, “it is a sad, mad me, you see”, encapsulates much of the tenor of the work, while the audience is given further insight into the mayhem that can be schizophrenia as Kiek and Ireland venture into the auditorium with torches, verbally assaulting the audience with commands and questions. It is a confronting simulation of the ‘voices’ often heard by those suffering this mental illness. Moments of humour act as a counterpoint to the pathos. The financial realities and frustrations associated with the medical profession are exposed in an amusingly manic scene between the patient (Scanlon) and a rather disengaged psychiatrist (Ireland), as at each stage of the consultation, the fee inexorably rises. The impotency of the telephone help-line (“is anybody there?”), and a very funny silent movie treatment of dual personality, Beryl Jekyll and Cheryl Hyde, also help us as the audience to identify, empathise, but also to laugh with Jeffs. Although the production values in MAD are basic, the individual performances each show great commitment and are therefore compelling, supporting the work, which while engaging and entertaining, nevertheless reminds us of our frailty, our humanity. Ten years go I doubt MAD would have even got to the workshop stage; such was the reluctance to talk openly about metal illness. Hopefully therefore, financial support for further development of the work will be forthcoming.